Our writers and editors take on Adele's new album, 25. Perhaps the most cringeworthy moment of Adele’s new blockbuster album, 25, comes during the Taylor Swift-esque guitar licks and high-pitched intonations of “Send My Love (To Your New Lover).” The Max Martin-penned track is probably the most un-Adele song the singer has ever attempted to bring in her wheelhouse, and it makes you wonder whether Adele was able to completely kick the writer’s block that reportedly forced her to scrap the “boring album about being a mom” that she wrote pre-25. But then, two songs later, the twinkling keys of Adele’s next sweeping anthem “When We Were Young,” (a “Someone Like You,” Part 2, if you will), discard the wayward notes of “Send My Love” in favor of one of the year’s most regal and moving anthems. True, Adele isn’t treading any new territory on 25, and there’s nothing as biting or edgy as “Rolling in the Deep” or “Rumor Has It.” But damn it if Adele doesn’t do wistful nostalgia better than anyone else. There’s the vivid imagery of “Can’t Let Go,” where Adele is as fiery as ever. Lyrics like “I gave you heaven on a platter, baby/I gave you everything you never gave me” melt beneath a stripped-down landscape. The entire album is a minimalist affair, which is smart because sometimes everyone just needs to get the hell out of the way and let Adele showcase vocals that are as breathtaking on 25 as they have ever been. Perhaps the album’s highlight is “Lay Me Down,” a soulful number that builds to a satisfying climax. While 25 may not be much of a departure from 21 in terms of content or style, Adele is able to breathe enough convincing heft into the record to allow it to stand on its own. I was sitting behind my desk at Olin, trying my best not to get distracted by the paper that I had due the next day. To further extend the procrastination period, I decided to take out my headphones and listen to music. I put my headphones on and hit shuffle. Adele’s “River Lea” started playing. The beginning sounded familiar, as I had heard the beats of many of Adele’s past songs. But out of nowhere I began hearing new beats tickling me and making me want to dance! “Adele has a dance number?” I wondered. My mind drifted off. “Would you like to dance with me?” I heard from behind. I turned back and saw my crush extending hir hand to me. We danced wildly in between bookshelves as Adele rambled about the river. The song ended and ze disappeared into thin air. I felt immersed in loneliness as the next song, “I Miss You,” began. I made my way outside Olin as the lights turned on ahead of me with every step I took. I got outside, feeling the wind brushing through my hair. I headed towards Foss Hill to catch the sunset. As I arrived at the top of the hill, the song was over. I looked down across Andrus Field and saw my crush with hir new significant other. “Hello, it’s me,” Adele started singing. As I gave myself up to the wind, I lip-synced to “Hello,” hoping to shed a tear and make the experience even more realistic. The song ended, and so did the sunset. I made my way back to Olin as “Love in the Dark” comforted me. I got behind my desk and continued staring at the blank Word document, trying to remember what my essay prompt was. Adele kept rolling deep in my mind. Let’s be clear: There is no one like Adele. She’s the “Harry Potter” of pop, the inexplicable British force that transcends age and culture and is beloved by all. And while many of the hits of Adele’s previous outing, 21, may lose their luster after being played in a coffee shop for the 10 thousandth time, they remain incredible works. 21 saw Adele’s unparalleled wrath toward her exes, coupled with self-aware restraint and bombastic expression of emotion. We couldn’t help but cry out with her amongst the insidiously catchy beats and expansive vocal register. So when I say I’m disappointed that 25 is relatively more of the same, you should take that with more than a grain of salt. “Hello” harnesses the same power “Rolling in the Deep” did four years ago. And after that explosive opening, the album becomes more subdued, more mature. Wrath has turned to a more contemplative sound, but the album continues to predominantly cover the same source material until the end. It remains to be seen if 25’s legacy will be anywhere close to that of its predecessor, because while Adele’s sound has certainly been refined, the album really doesn’t explore anything new. But why complain? It’s a wonderful album. The pulses in “Miss You” grab you and never let go. Adele continues to sing about her feelings in a way that makes them sound like a force of nature, to the point that would make Florence and the Machine blush. Her fusion of genres allows her to brand herself as unique. And as long as she continues her grandiosity over a simple piano melody, I’ll be sure to follow. Rather than detail my own feelings on Adele’s 25, I feel compelled to meditate on my mother’s opinion instead. Given that she was the biggest fan of 21 I know, I had assumed that she would be equally enthused by the latest efforts of the British pop artist. However, after upon receiving a clip of the album’s hit song, “Hello,” she replied that she was unimpressed and actually quite disappointed. The song spoke nothing to her. This intrigued me. After all, this track was similar, if not the closest of the album—both lyrically and tonally—to 21. Yet my mother still insisted it wasn’t the same. While I can attest this change in heart to the artist’s shift in genre—25 is resoundingly more pop than soul—I also can’t help but think that the real reason is the passage of time. In 21, Adele articulates an incredible emotional depth, illustrating the many strains of human heartbreak and sorrow. My mother, dealing at the time with my impossible teenage self, found sympathy and empathy in this music. Rather than having to speak of her disappointment and frustration, my mother could turn on the album instead. She had a translator, an ally to combat those painful years of waiting for me snap out of my adolescent stupor and grow up. Yet with 25, Adele focuses on a different emotional range, having become a mother herself. Here, she can celebrate this new chapter of her life, as she starts a relationship with her baby son. Given that I am now in my twenties, my mother and I are no longer as interlinked as we were when I was in high school. She and I are our own individuals, our emotions are no longer parallel, and my success is no longer transitive to her. And so when my mother, now an empty nester, listens to 25, she cannot find the same resonance. I don’t mean to imply my mother is lonely. On the contrary, she is excited to take ownership of her time. A free bird, if you will. But, this album, which celebrates the novelty of maternity, is pure nostalgia for my own mother. It doesn’t answer the same emotional questions she has now. 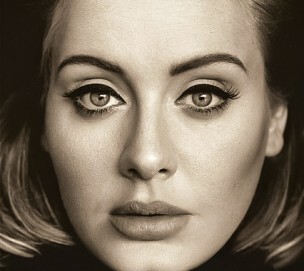 I suppose for my mom, she will simply to have wait for Adele’s 55 instead. When I first listened to 25, all I could think was, “That voice.” I love and appreciate Adele’s voice as a sort of entity in itself, and it was one of the main reasons for my love of 21. But by the end of this album, I realized that all I was really hearing was her voice. I couldn’t find much else to hold on to. The songs seem like cleverly constructed conduits through which to propel an incredible voice, but not much more than that. The lyrics are often clichéd, and the album is missing the range of stylistic surprises that 21 gave us, like the raw anger of “Rolling in the Deep” or the sultry, bluesy feel of “Rumor Has It;” even Adele’s vocal approach seems rather safe in comparison to 21. Perhaps there’s something to the fact that Adele didn’t write this album from a place of heartbreak, as she has openly stated. Adele seems to veer more towards nostalgia here, lamenting the passage of time and looking back at the past from a distance. Maybe there’s a little too much distance, because while this is obviously weighty subject matter, the emotional urgency just doesn’t come through in the way that it did on 21. In the final chorus of “When We Were Young,” a striking, unabashedly sentimental ballad, Adele sings with a beautifully breaking voice, “I’m so mad I’m getting old, it makes me reckless.” This album is about getting older, and the songs do possess a polished, controlled quality that fits with that theme of maturity, but I found myself wishing that Adele would get just a bit more reckless. Overall, though, I’m not totally disappointed. There’s a refreshing level of humility in Adele’s decision to keep the focus on her voice, if that’s what she intended, and it’s certainly a voice worth focusing on. Adele’s voice cuts through and sparkles even without the support of an imaginative platform, and I’ll happily keep listening to that voice for its own sake, whatever packaging it comes in.